The U.S. Supreme Court will soon hear arguments in the case of American Broadcasting Companies, Inc. v. Aereo, Inc. (13-461) on the issue of whether a company “publicly performs” a copyrighted television program when it retransmits a broadcast of that program to thousands of paid subscribers over the Internet. This is an important case with far reaching implications for digital video recorders, cloud computing and the sale of movies and music online. It is also, unfortunately a case focused on exactly the wrong issue. Aereo is just one of a long sequence of technologies that have raised conflicts between the interests of content owners and technology companies. Aereo offers the consumer the ability to watch live tv over the internet with the ability to pause, rewind and fast-forward programming. Aereo provides this service by receiving free to air tv signals on a vast array of micro-antennae. Each antenna is dedicated to an individual subscriber. The tv signals so received are reduced to individual copies of individual programs. These copies are then transmitted to the subscribers. 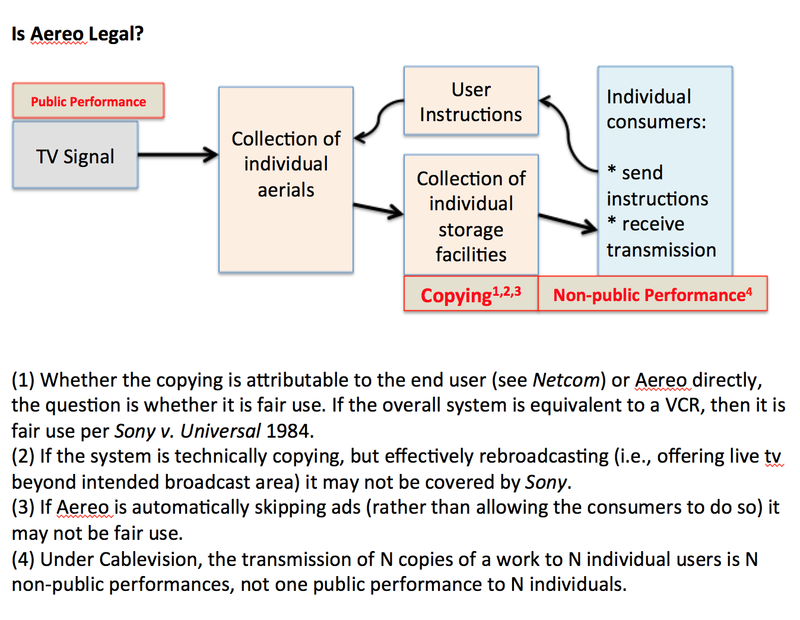 The Second Circuit held that Aereo’s system did not implicate the copyright owners’ public performance rights under the Copyright Act because each transmission was from a single fixed copy to a single end-user. On the Second Circuit’s view, although Aereo’s system may transmit any given program to a large number of end-users (N), it is best understood as N one-to-one transmissions, not one one-to-N transmission. A number of broadcasters including the titular plaintiff, American Broadcasting Companies, Inc., argue that the Second Circuit’s understanding of the “transmit clause” – part of the definition of the public performance right under the Copyright Act – is flawed. The Broadcasters proposed a reading of the act that would render any transmission, from any source, a public performance if it is capable of being received by a sufficient number of persons. The broadcaster’s preferred reading of the Copyright Act would overturn the Second Circuit’s decision in Cablevision, a case involving a remote digital video recorder (R-DVR). Cablevision should not be overturned: (1) The broadcaster’s preferred reading of the Copyright Act is incorrect as a matter of legislative history and statutory construction. (2) The policy concerns raised by the broadcasters and some commenters are misguided. (3) The legality of the Aereo system should turn on the application of the fair use doctrine Aereo’s internet tv service, an issue that the Supreme Court has not been briefed on, but will surely get a full airing in the Second Circuit if the Supreme Court affirms the decision currently under review. I have added some pictures below that flesh out some of my tentative thoughts on this subject. The Supreme Court is addressing the wrong question in #Aereo. I will be speaking about the ongoing Aereo litigation tomorrow at the Northwestern Journal of Technology and Intellectual Property’s Annual Symposium. On April 22nd the Supreme Court will hear arguments as to whether a company “publicly performs” a copyrighted television program when it retransmits a broadcast of that program to thousands of paid subscribers over the Internet. My view is that this case should not be about public performance. The court in Cablevision got that one right, no other reading of the Copyright Act makes sense. The Supreme Court should hold that a single aerial (or N aerials) that copy and transmit at an N:N ratio is not 1 performance to N people, it is N performances to N people and thus not “public”. This does not mean Aereo is off the hook. 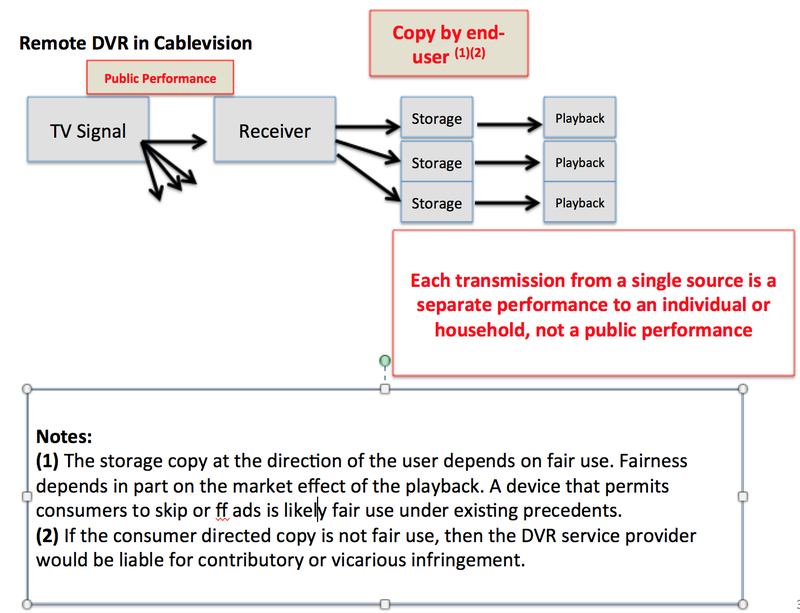 Cablevision’s device is consistent with the Supreme Court’s Sony Betamax decision from 1984: copying made possible by a remote-dvr is fair use. 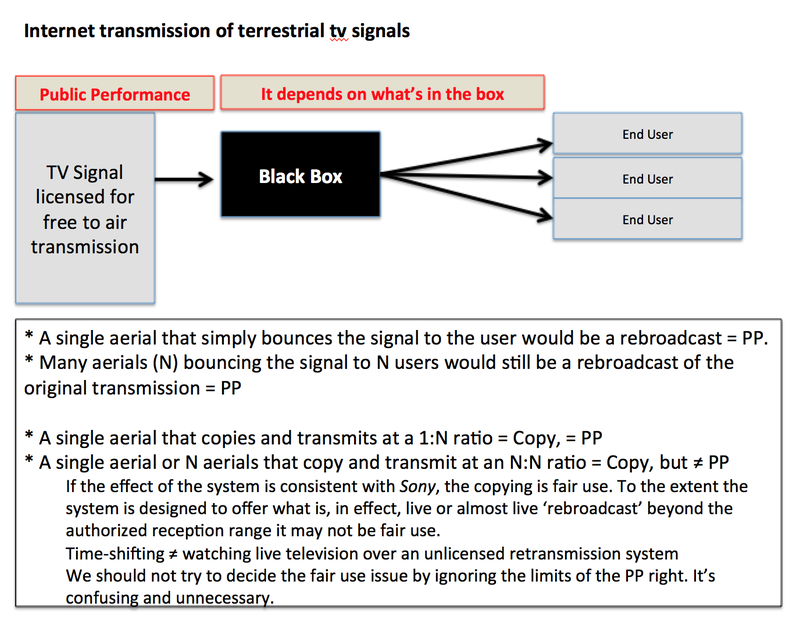 However, to the extent the Aereo system is designed to offer what is, in effect, live or almost live ‘rebroadcast’ beyond the authorized reception range of the original broadcast it may not be fair use. This is an open question, but the Supreme Court can’t decide it because it has not been briefed on the issue. Whether a company “publicly performs” a copyrighted television program when it retransmits a broadcast is not the right question. Critics of Cablevision seem to think that if there is no public performance right for an R-DVR, then there is no tolling point at which creators get paid. 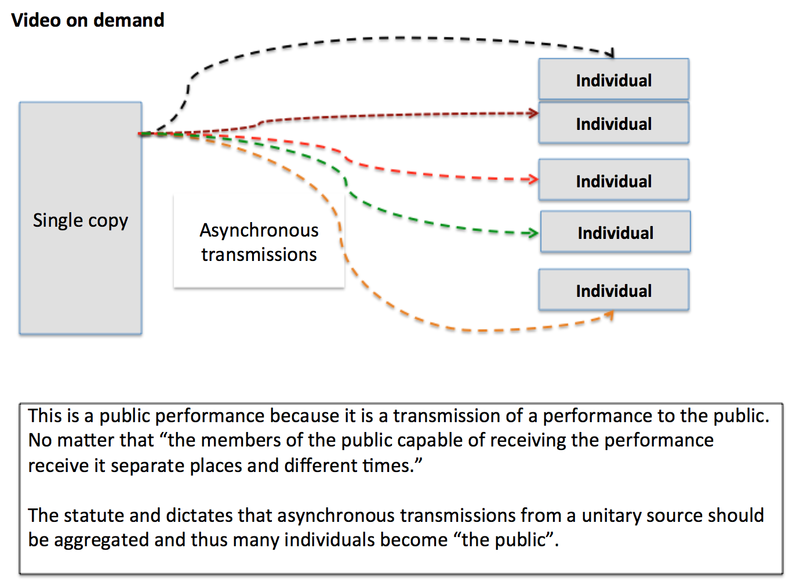 But avoiding public performance does not avoid the initial broadcast or copying. I have some slides that go into this in a bit more detail. Comments welcome. Jason Schultz, Brian Love, Jim Bessen and Mike Meurer have put together an excellent “Brief of Amici Curiae Law, Business, and Economics Scholars” in Alice Corp. v. CLS Bank, a case about to be argued before the US Supreme Court. 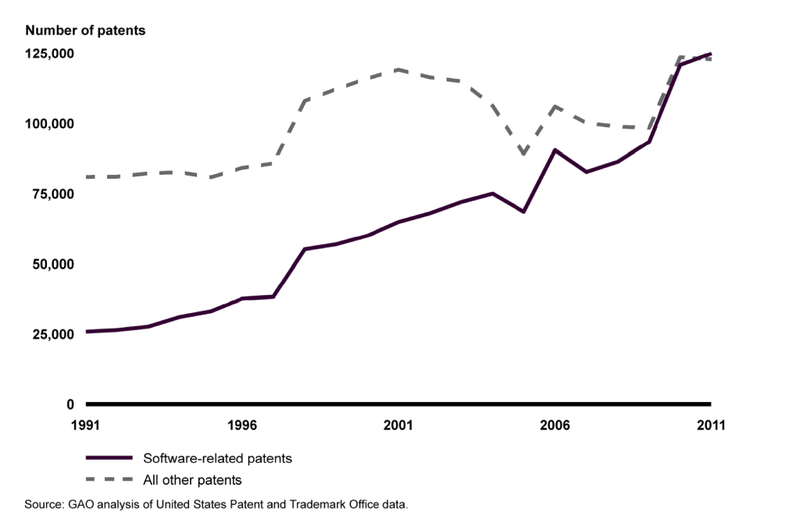 I signed this brief because I believe that the experience of the last 20 years shows that extending patent protection to abstract ideas and software functions does far more to impede innovation than it does to encourage it. 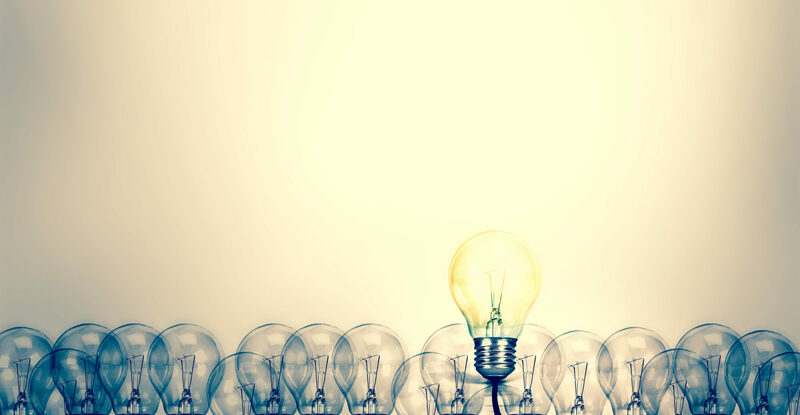 The U.S. Court of Appeals for the Federal Circuit has expanded the scope of patentable subject matter for abstract ideas over the last 20 years (see, In re Alappat, 33 F.3d 1526 (Fed. Cir. 1994) and State Street Bank & Trust Co. v. Signature Financial Group, Inc., 149 F.3d 1368 (Fed. Cir. 1998)). This expansion has lead to an explosion of software patenting and software patent litigation. Abstract patent claims award rights beyond the scope of actual invention, their boundaries are unclear, they don’t provide notice to third parties and, for all these reasons, they invite opportunistic litigation. The Supreme Court granted cert in this case to decide “Whether claims to computer-implemented inventions—including claims to systems and machines, processes, and items of manufacture—are directed to patent-eligible subject matter within the meaning of 35 U.S.C. § 101.” I expect the court to rule computer software is patent eligible, but that patent examiners should reject over-broad software patent claims on the basis of lack of patentable subject matter. As the divisions in the Federal Circuit’s en band decision show, it won’t be easy to develop a standard to determine whether a computer-implemented invention is a patent-ineligible, abstract idea.